The traditional Hawaiian fine art of hula has become very popular world-wide and especially in Japan, where there are approximately two million dancers and enthusiasts of this time-honored Hawaiian practice. 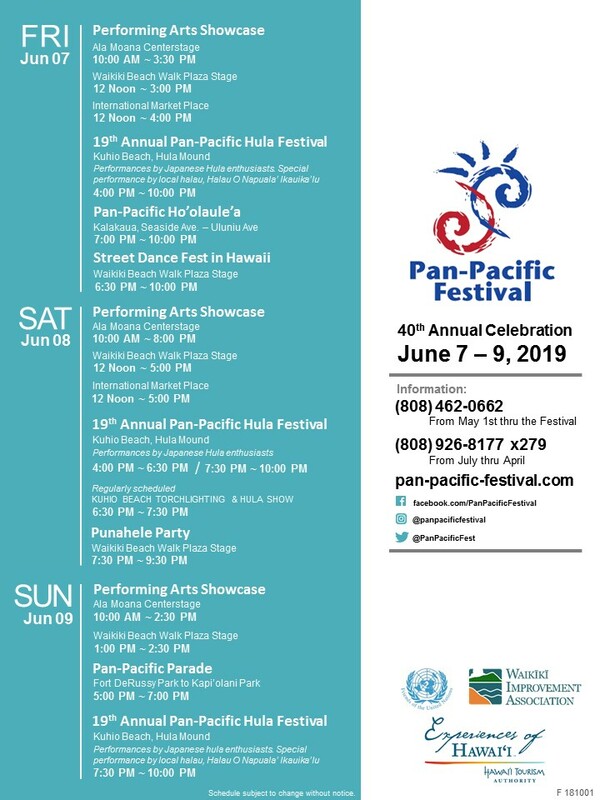 The Pan-Pacific Hula Festival provides a dream opportunity for many of these groups who train all year long, in anticipation of dancing the hula in Hawaii – the birthplace of this much revered and appreciated art form. A true example of cultural exchange, you will see a talented assembly of halau (hula group or school) from all across Japan performing their interpretation of the hula on stage. In addition, the audience will be treated to a special exhibition each day performance by local hula halau, Halau O Napuala ‘Ikauika ‘Iu led by Kumu Hula Sally Yoza of Honolulu. The art of hula was originally performed by trained dancers in temples under the direction of priests to honor the gods and praise the chiefs. Referred to as hula’kahiko, ancient hula was traditionally accompanied by a oli (chant). Wristlets, anklets and necklaces of animal teeth, bone, or shells were common ornaments for this ritual. The women wore pa’u (short skirt) and the men wore malo (tapa loincloths). The “music” was the accompaniment of traditional instruments, such as the ‘ipu (gourd), split bamboo sticks, stones used as castanets, and pahu drums (made of sharkskin). Contemporary hula, commonly referred to as hula’auana, arose from the adaptation of traditional hula ideals to Western influences. It is primarily a visual dramatization of a story or description as told through sinuous movements and gestures to mele (song). Costumes may be skirts of raffia, or freshly cut ti leaves and lei (interwoven flowers or leaves). Most notably, the music is based on Western chord progression, utilizing instruments such as the ‘ukulele, guitar, and double bass.